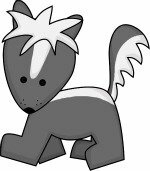 Skunk with his new stripe and stink! Once there were four great forest friends. And their names you surely know. He preferred a lazy life of ease. Squirrel did all the cooking. He could prepare the most delicious dish. Everyone agreed the food was tasty and scrumptious. Rabbit was in charge of burrow cleaning. Upon entering she made them wipe their feet. And we can’t forget dear Sparrow. He was the look-out high up in the trees. And reported danger that friends below couldn’t see. And scaring his friends in frightening ways. And he was the most beautiful creature for miles. And it brought many oohs, aahs, and smiles. It was a breath-taking sight for sure. And perfumed it with Calvin Klein for Fur. So they knew this behavior they must fix. Skunk had caused them a horrible fright. “And caused me to give a loud shriek? “Last Friday night as a grizzly bear? “As I was scurrying up a tall pine tree. That I soon felt the pain of gravity! That the forest King must have help to lend! Massaging an old and aching wing. One that would not be soon forgot. So he can’t catch you off guard. By changing his beloved and beautiful tail. That he didn’t look the same way. He might as well have been painted red! But he was not so very discouraged. Two white stripes were not that bad. So he turned his frown around and was glad. And Skunk leapt nearly a foot in the air. He smelled an awful, disgusting stink! And then Rabbit gave him a wink. We’ll do the same and you’ll be in a cloud of P.U. “What do you mean? What’s this about? And Skunk finally agreed to be scare-free. In case his tail-smell accidentally leaked! And always work hard at what you do. May make you smell like an old shoe. Thanks for a lovely little story. It is NOT too long ... it's just exactly long enough! I work in a Memory Unit at an assisted living facility as an Activities Directory and loved reading "How The Skunk Got It's Stripes" story to my residents. We have Interactive story time where each one holds a bell and when one of the animals was mentioned they ring their bells. This story was a great for story time. Keep up the excelllent work. I like this silly story. It has a fun and playful style to it - little kids (3 to 6) will surly enjoy. It may be a tad too long though. You might see if you can write it a little more concisely. I like the visual imagery you created. I hope you continue to rework and refine it. Short stories are among the hardest things to write well. Each word must propel the story forward. Concise writing is also a critical element.